Photography: What’s drawing the eye (visual mass)? 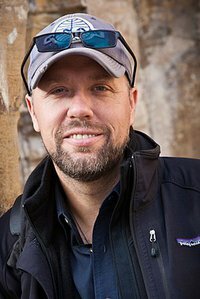 David duChemin - world & humanitarian photographer, best-selling author. If you like taking pictures, then you’d probably prefer taking pictures that people like to look at as well. Sometimes we get lucky and capture a great shot, but often it takes a little bit of thought or planning to get it just right. Remember, don’t just take pictures – make them! One thing you, as a photographer, should be aware of, is visual mass – ie. what’s “drawing the eye”. The human figure before anything else. Objects that are large before objects that are small. Objects that are bright before objects that are dark. Elements that are sharp and in focus before elements that are out of focus. Elements that are recognizable before those that are less recognizable. Elements that are presented obliquely or in perspective. Elements that are warm before elements that are cold. Elements of emotional significance over those with none. Now, there’s much more to it than just the eight points above. There are also some but’s that you need to be aware of and to learn more as to why, how, when and much more, I recommend taking a look at this eBook which I recently bought myself, Drawing the Eye – creating stronger images through visual mass by David duChemin. It’s just $5 and it’s well worth it, considering how much money you probably paid for your camera equipment, these five bucks will really open your eyes (so to speak). Close To Home Finding Great Photographs in Your Own Backyard by Stuart Sipahigil. The Vision-Driven Photographer – Notes on Discovering & Refining Your Vision by David duChemin. TEN – Ten Ways To Improve Your Craft. None of Them Involves Buying Gear by David duChemin. Once I’ve finished the books above I’m probably going to buy a few more of his books. I love the way he writes and he’s much more focused on vision than what kind of camera equipment to use – which, to many people, is really what matters the most. Personally, I like gear since I’m a “gadget freak”, but gear alone doesn’t make great photographs and that’s really what I would like to learn more about: making great photographs! Most of the eBooks are available as iPad apps as well, directly from Apple’s App Store. I went with the PDF versions though, so I can read them on other devices than just the iPad. On the iPad, I’ve imported them into the iBooks app but you can use pretty much whatever PDF compatible app you want or simply read them on your computer. I like this – “don’t just take pictures – make them!” I am an enthusiasts but do not have the time to pursue photography. I do try to employ certain tactics when I take pics. I want to capture and freeze the moment and not just have a photo. Gotta give yourself a gift too, so maybe you can find a good used DSLR somewhere 🙂 They’re not that expensive anymore compared to the new ones. It’s good to see you digging into all this. It’s also fun! I hit my photographic interest peak about 20 years ago at 25 years old. Read everything I could find, studied and took thousands of….get ready…..slides! Used a Nikon FM2 camera back then which is a full manual 35mm rig with a pretty crappy light meter inside it. I still love photography today but need to go back and study again as I’ve mainly just been shooting kids and sports and my kids playing sports, etc., for the last 13 years! Not the most creative medium. The FM2 looks like a cool camera, but it’s kinda old so I’m not surprised if the light meter was bad. But on the other hand, who needs light meters now a days? Just learn to see the light with your eyes and set up the camera 😀 (I know, I know, that’s easier today when you get an instant result on the LCD – not as easy, or cheap, back in the film days…). I would love to duCheminify my photos more, but it takes time to learn and time is not what I have so much of. When we get 30 hours per day, I can do it. Till then I just have to make do with shooting a bit every now and then, especially this time of year when it’s only the weekends I get to see any daylight (sun is unly up for like 5-6 hours a day now). Yeah, I hear ya. I remember reading books and immediately going out and trying to apply everything. It was a lot of fun and occasionally I would get it right and take something interesting. Where are you, up in Scandinavia somewhere? Yep, in Scandinavia right now for the holidays. Love connecting neuroscience with vision and photography! I am going to test these ideas. Thirty years years ago, I too had a Nikon FM2 studying photography. Shooting over 300 rolls a year, I even slept next to my camera if I was not at home. I wore it well. The FM2 is like a rock. All metal, it even shoots with no light meter/battery, which lasts for years. Everyone could know their camera and light so well. Traveling in the mountains with a dead spare battery and none available …. still meant great pics. This was my life. The needle light meter I thought was fine, using my hand for a gray card, though I could have used a hand held if I had wished. I used the camera meter for the zone system, developing my B&W film accordingly. When motherhood came along, I found baby and camera rested at the same place on my heart and chest. I dropped to only 20 rolls a year. Baby was more important than camera, no regrets. Fast forward 25 years, we have two Nikon D90s and three grown kids. Digital camera batteries are a whole new ball game, and you lose if they die or you do not keep them warm enough. I am teaching myself computers and Photoshop CS4. It is a steeper learning curve than I expected, but it is now so much easier to combine photos and be creative than when I began in the darkroom. This is my new life! Time can open as kids grow older, but they need you most intensely when they are young. Your love for photography can rise again. Thank you for your post! Even though I can relate to your short shooting times, there are advantages. And isn’t the net wonderful that we can talk across the world and time. At 55.2 N latitude in Alberta, Canada, we have just over seven hours of daylight on winter solstice. Much easier now to rise for the sunrise at 9:20 am, and the sun remains so low in the sky that it is side light all day, which adds much depth to photos. Sunrises and sunsets last longer. Civil twilight lasts for 45 minutes, compared to only 20 minutes at the equator, morning and night! Even in the summer the sun remains lower in the sky and twilight lingers between night and morning, never quite dark, while we enjoy over nineteen hours of mostly sun. Of course we pay with long winters, down to -40 C and F, and snow sticking maybe October to March. But as you know, such beautiful frost, fog and ice. Since moving here from Washington state at 46.2 N latitude with over seventeen hours of daylight in summer and eight and a half hours of daylight with 25 minutes of civil twilight at winter solstice, this winter has been the first in 25 years that I cannot call a White Christmas. We cannot decide whether it is a brown or gray Christmas. There is some snow remaining on the grass since November that allows brown to show through, but there is more grey than brown because you see the sidewalks and the roads more. Often here the snow is piled higher than eye level on some sidewalks. Not this year. Global warming is happening in our photographs, and we may be able to change now, easier than later, when it may be too late. Just wanted to say thanks for posting such a nice long message – wouldn’t want you to feel as if it wasn’t read 🙂 In fact, I read it on my iPhone during Christmas Eve when I needed a break from all the Xmas stuff, so good thing you posted it that day. Amazing to read your post, Really I would like to tell you a truth that your blog increase me to be a photographer. I do read your blog twice a week and every time there is some thing special in your blog about photography tips. Thanks. I’m glad you like it Jennie. Do you currently have a camera, a DSLR perhaps? I have a camera in my car and I take shots which comes to my fancy, not knowing if they pass muster. I will be reading up on these books to improve my skills. Reading through the tips, I think most of us know these principles based on experience, but I’d never sat down to think about most of the principles. It seems like these would be especially good for analyzing your work to see where you need to improve an image to make it more impactful. Good point, TJ. I also knew some of the points duChemin makes but not all of them and probably not in the right order either. That’s the perfect idea. Don’t just take pictures, but make them. I enjoy taking photographs even if I’m not really good at it. However, I’m not gonna give up. I know I can develop the skill. Since I don’t have a very good camera yet, I’ll try the eight points that yo have shared. Thank you. I have read David DuChemin before as well. He does have a lot of great information to offer. Thanks for the review. It has been a few years since I had a good digital camera. Good points when your just getting back into photography. I am going to give some of David’s suggestions a try. Wow! Those 8 points David stated really make sense. I am also a “gadget freak”, but I saw for myself that I could take great pics with some cheap camera. No doubt that a high quality DSLR makes the picture even greater, but that’s no excuse for us unleashing our creativity. If I feel like playing through taking pictures I just let myself into it. It would be a pity to find myself such a poor excuse as not having a pro camera. Great article! The point definitely made sense to me. Nice article, some really useful comments. very nice and informative post and helpful for people like me! I’m interested to hear your thoughts on the dawn of digital. Has digital taken the soul away from traditional photography and allowed too much cheating to be possible via photoshop etc? Incidentally, I have seen two grasshoppers, male and female, are mating in a chili tree in my garden. The event like this are rarely happen. Therefore, I try to take pictures from several sides. It is fun to take pictures of such the event which may rarely seen by us. Such a fantastic book . I’ve read it multiple times now, and I think my pictures have increased in quality at least 3 fold. Although it just 1000D, i alwasy looking for something new in photography through magazine and internet..
What makes Samsung the top 5G company of the World?